Charlotte Carver is going insane—suffering with everything from memory loss, to hallucinations, to phantom conversations she can’t recall having. Something tells her it’s not a coincidence that it all started when the MacGregor family moved to town, and the one person who knows what’s going on is the last person Charlotte would ask for help. Her new landlord, Niall MacGregor, is not the most approachable man but that hasn’t stopped the brooding Scottish biker from invading her dreams. 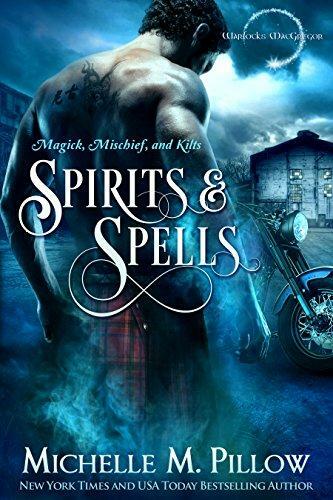 Motorcycle riding werewolf, Niall MacGregor is the longtime supernatural enforcer for his warlock family. He has regretted more than a few things he’s done in the name of duty, but taking Charlotte’s memories is the biggest. It was necessary, to both protect the family and save Charlotte’s sanity. But the intimate glimpse into her mind has only made him want things he can never have—including the gorgeous, brave woman herself. When luck finds Charlotte’s memories returning, her attraction to Niall explodes, thrusting her into a magickal world. There is little time to adjust as another of Niall’s past regrets has come back to threaten everything they hold dear. Warning: Contains yummy, hot, mischievous MacGregors who are almost certainly up to no good on their quest to find true love.